I’ve seen this topic discussed here and there, but nothing really in depth. We do it quite often here in the lab and it is great for “tenderizing” the meat. Why the quotations? Well, because it doesn’t tenderize the meat per se. Rather, by increasing the brine retained by the meat and in effect it’s juiciness, the perception of tenderness is increased. The method used to incorporate the brine is by injection. Just buy one of those turkey injectors from Walmart or something. If you have access to a vacuum tumbler that could work too, but that tends to give meats a bit of a rubbery “i got the crap beat out of me” texture. Another reason to inject a hydrocolloid brine into the meat is for economics. You want good roast beef, but not everyone can afford a $30 / lb prime rib roast. You still want that tenderness and juiciness. Well, you can get a top sirloin cut, which is about roughly a quarter to a third of the price. Inject it, brine it, treat it with respect and it will be pretty damn close. 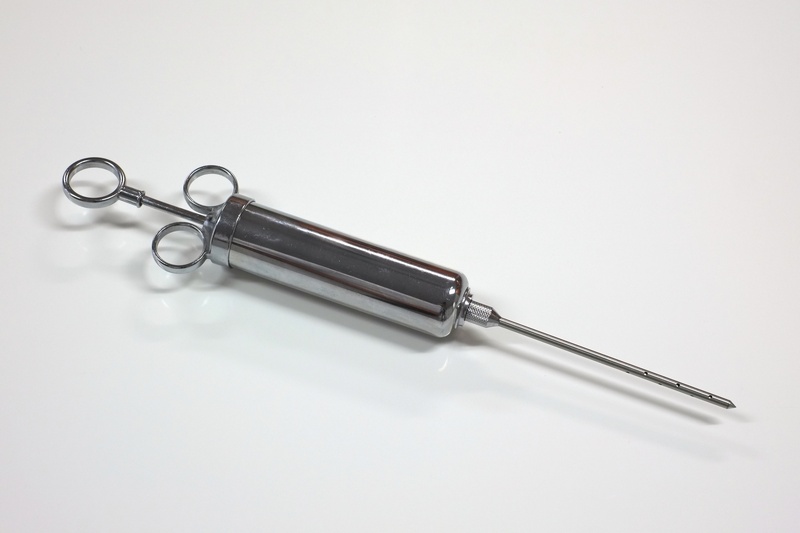 Tool of choice – Handheld meat injector. Notice the holes on the sides of the needle. You can definitely increase juiciness with just a salt water brine, or an aromatic brine. Unfortunately, when you bite into the meat, there is little viscosity to the injected brine that the juice just runs off when you bite in. 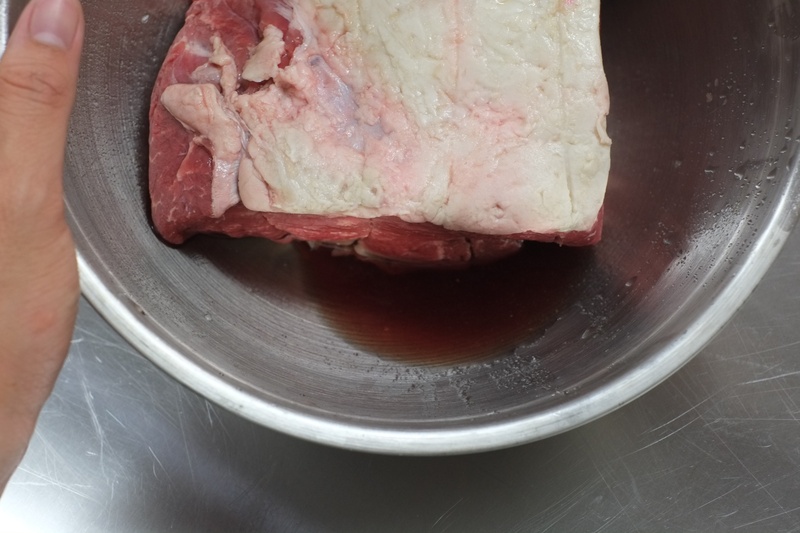 Also, simply submerging the meat in brine can take quite a while for the flavours to really penetrate. With carrageenan or other gums in the brine, the viscosity is increased and the perception is that the juice is gelatinous or fatty. With hydrocolloid brines though, I must emphasize that you really need to inject it or vacuum tumble to really get the brine in there. 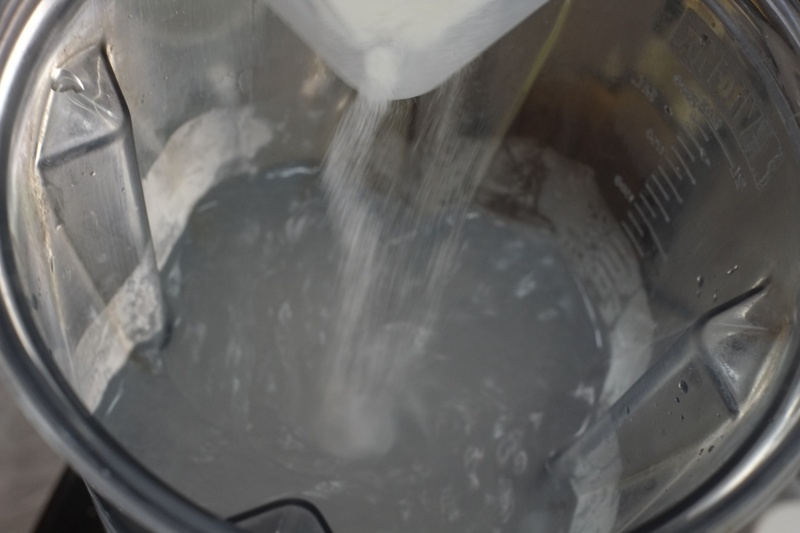 There’s also some techniques or rules of thumb to keep in mind when using a carrageenan brine. 1. Delay the gum’s hydration or swelling. There are various ways to do this depending on the type of gum. With carrageenan, you will usually add the salt first to the brine. Another way to delay or slow down hydration is by getting the water as cold as possible. 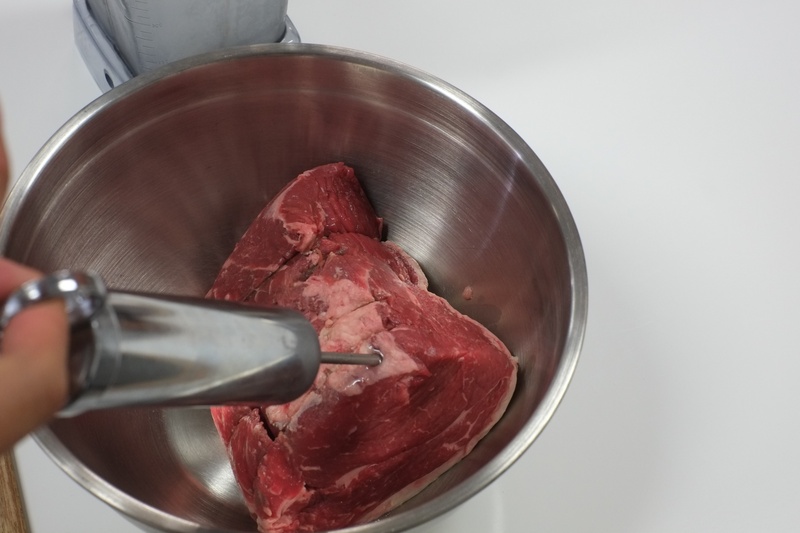 You want to do this in order to help the hydrocolloid disperse in the meat better. 2. Rest period after injection. This is more of a personal preference. Again, just to help the brine distribute itself evenly. At least 4 hours I’d say. 3. Increased cooking time. Remember, you’re adding liquid into the meat, and as a result, adding more weight. More weight means longer cooking times. 1. Carrageenan blend of kappa and iota. Kappa for bite, iota for fattiness. Usually I use a 80/20 blend of kappa to iota. The amount of carrageenan is about 1% – 2% of the entire brine. 2. Sodium alginate. Not personally familiar with it, but our meat guy says its quite tricky to activate the sodium alginate with the calcium. So when preparing a hydrocolloid brine, this is what you would do. First, add salt to the water. Then add ice. 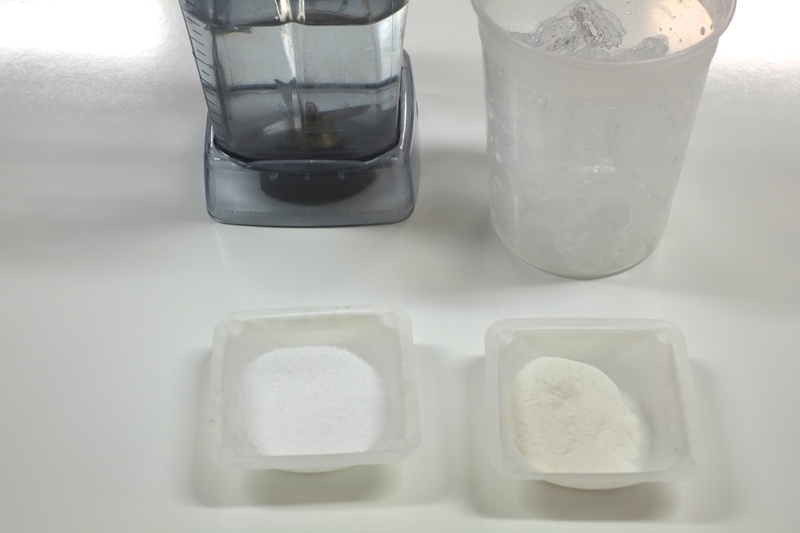 By having salt dissolved in the water, this will lower the melting point of the ice, allowing the mixture to be liquid at even lower temperatures. 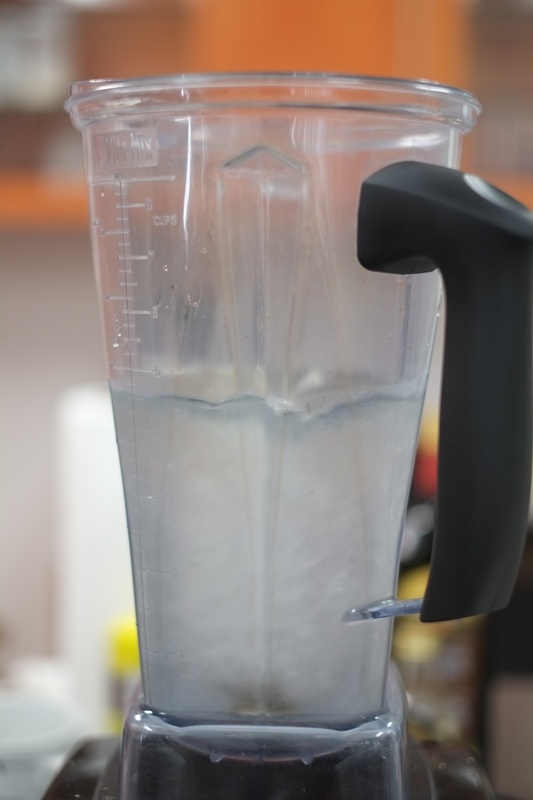 Go for a 70/30 or 80/20 ratio of water to ice. Then, add the carrageenan. 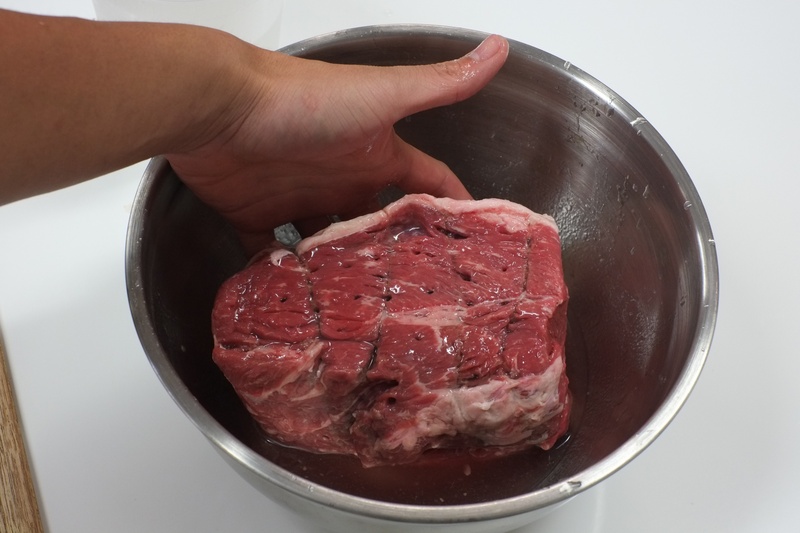 Once thats done, inject as much as you want into the meat. Obviously you don’t want to add too much to the meat. You don’t want a meat thats way too watery. Salt and ice already being mixed with the water. Giving it some time to dissolve the salt and melt the ice. Once ice is melted, slowly add your hydrocolloid of choice. Food for thought – Imagine some of the possibilities with using aromatic/flavoured brines. Injecting mushroom stock into a roast. Perhaps some curry spiced brine into pork or chicken. Chefs have been using aromatic brines for ages. This technique is just another way to incorporate the brine into the meat. Here’s the meat being injected. Here it is after injection ready for the resting period. Looks like the victim of a Martin Scorsese hit job. Don’t worry, the holes disappear during the cooking process. Day after. Some of the brine does leave the meat, but much of it is still contained inside. Aaaaannnnddddd… where’s the cooked meat? Sliced it up and ate it, oops. Completely forgot to take a photo. There’s really no difference in appearance to a regularly roasted top sirloin though. This entry was posted on Tuesday, August 20th, 2013 at 4:15 pm	and posted in Uncategorized. You can follow any responses to this entry through the RSS 2.0 feed. « The French Laundry – an epic pilgrimage for anyone who loves food. How do you think you might use a carrageenan brine to make lean hamburger meat juicier? I’ve been wanting to do that specifically to recreate the consistency of the patty in McDonald’s’ McLean Deluxe from the ’90s. I think I would make a slurry first. We have a product that is specifically to make ground meat patties/sausages jucier.